Inadequate blood evacuation as a result of blocked chest tubes can lead to Retained Blood Syndrome (RBS) – the composite of drainage-related post-cardiothoracic surgery complications that are detrimental to patient outcomes and may require reinterventions hours, days and even months after the original procedure. A recent retrospective study analyzed the ICD-9 billing codes for a total of 40 million inpatient procedures in the US. Researchers identified a total of 313,766 adult cardiac inpatient procedures and IDC-9 codes suggesting that 53,018 (or 17%) of those patients had suffered one or more reinterventions due to Retained Blood Syndrome (RBS) complications. See if you recognize some of these RBS complications in your patients. Presented at the Cardiovascular-Thoracic (CVT) Critical Care 2014 annual meeting, organized by the Foundation for the Advancement of CardioThoracic Surgical Care (FACTS-Care) in Washington, DC on October 10, 2014. Re-operation for tamponade 3 hrs after transfer to ICU. 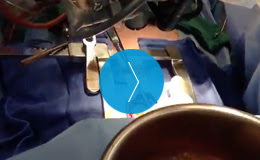 Watch accumulated blood being removed from the chest cavity. A growing body of clinical evidence demonstrates the impact of Retained Blood Syndrome (RBS) on patient outcomes. Download the PDFs below to review in more detail.